A new book explores the way women farm, network, and create community around food. Women now account for 30 percent of the farm operators in the U.S., a number which has almost tripled in the last three decades, creating the fastest growing segment in agriculture. But beyond the numbers, women are at the forefront of an important shift in today’s farm landscape. Namely, women tend to farm on smaller pieces of land, grow diverse crops, favor sustainable practices, and prioritize food over commodity crops. In their new book, The Rise of Women Farmers and Sustainable Agriculture, a quintet of authors—Carolyn Sachs, Mary E. Barbercheck, Kathyrn Brasier, Nancy Ellen Kiernan, and Rachel Terman—take a close look at two trends happening simultaneously: an increase in the number of women farmers and a growing demand for sustainable agriculture. Terman took time to share some insights into the trends and what she learned while researching the topic. Why did you all decide to write about this topic? We wanted to discuss the influential role that women farmers are playing in agriculture and look at how these two trends have come together and impacted each other. We also wanted to highlight the voices of women in agriculture and share their stories. The information in the book is based on 10 years of research with the Pennsylvania Women’s Agricultural Network. Why focus on women in agriculture? The census data was compelling. [Until 2002, the U.S. Department of Agriculture only allowed one principal operator to be counted; in most cases, a man claimed the title.] When the data collection changed, it allowed more women to claim the status of “farmer.” Over the last decade, the role women play in broader society has changed; more women are taking on identities as business owners and professionals. Because of this, there are more women who have been able to get into farming and we wanted to look at what role women are playing on the farm and how it was impacting agriculture. What, if anything, makes women and men different as farmers? Women tend to have less land to work with and less access to the labor and capital needed to get their operations up and running. For this reason, we’re seeing more women pursuing opportunities in sustainable and organic farming where they can farm on smaller pieces of land with less equipment. 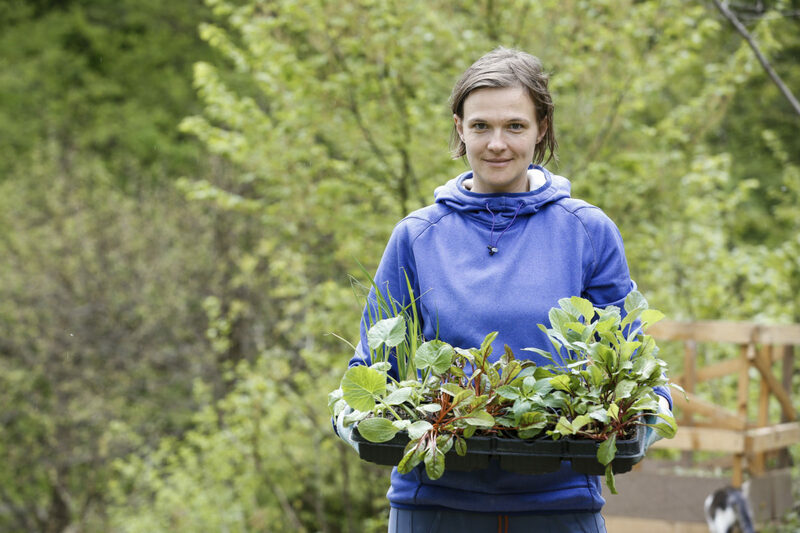 Women are also putting together farms in different ways than conventional agriculture. Their operations are more diversified and often include educational components. Women have also been really good at developing networks of women farmers to share information. Learning how to farm and create business models can be overwhelming for new farmers. In other scenarios, farmers may be reticent to share information about their businesses, but we found that women who were successful farmers were willing to open up about what worked and didn’t. This kind of peer-to-peer networking has been an important innovation for women farmers. In the book you write, “A profound shift is occurring among women working in agriculture—they are increasingly seeing themselves as farmers, not only as the wives or daughters of farmers.” Why do you think the shift has occurred? The women’s equality movement has helped acknowledge the different types of work that women do on the farm and women are stepping into that role more so now than ever before. They are really claiming the role, saying, “I am the farmer.” Even though we’re starting to acknowledge the numbers of women farming, I don’t know that the work they’ve done, especially in developing sustainable agriculture, has been acknowledged very widely. I learned so much. I was most impressed by the innovative strategies women were using to stake their claims as farmers. One of the women [featured in the book] has an urban farm and also developed an educational program for kids; she was able to get nonprofit status because of the educational aspect of the farm. Creating a business model that combines farming and growing vegetables with community and education helped open up opportunities for the farm. Another farmer coordinated with her local township to farm on community land. Without that creative idea, she might not have been able to access land. I don’t want to paint a broad stroke, but it does seem like the women involved in sustainable agriculture are especially interested in multiple factors involved in farming like the environment, health, food, nutrition, and how the farm is connected to the community and the community is connected to the farm. It’s a different balance of priorities than we see in [male-dominated] conventional agriculture. We hope that the book will encourage more women to be leaders in agriculture and hope that it helps people involved in agricultural organizations and institutions to support women farmers and develop resources and programming to best serve women in agriculture. We also hope that others find the stories of women farmers to be inspiring. There is a family owed organic sustainable farm store here Templeton Ca that is owned by Melanie Blankenship a farmer all her life. The business has been operating for 20 years and offers education too. We are happy to have her! I am a farmer in Australia. We have a small holding of 18 acres. It took a long time to call myself a farmer because I didn't see myself as one. My father always ran the farm and I helped do the work. It wasn't until he couldn't do as much that I started to do more and take over the responsibility of running the farm. Now I call myself a farmer. It still feels weird but it's the truth. As a woman farmer on Dartmoor in England, I find this fascinating and heartening but not that surprised in the different approach that woman have. Traditionally the farmer's wife was the maker (in this world put value on product), but in more recent times, due to economics has had to go out to work. There is a sense that things are changing here, smaller farms to survive will have to look at extra value. I am looking forward to reading your book and I am fascinated by the impact female farmers are making in their communities -- Not surprising as women are very multi-dimensional ! I work at AGCO Corporation and I am a member of AGWN - Women in Agriculture . We would love to host an event for you if your travels bring you to the Atlanta, Georgia area. Please contact me if interested ! I am Haydee Navarez, the first elected president of f Association Women in Organic Farming located in the Philippines. We are committed women farmers who would like to produce safe and healthy food for the public. Our main goal as a group is o help other women farmers to engaged in natural and organic ways of farming. We would like to know more about your group and be with your partner. Our FB page is active, please check it out. Hi, I am a Kenyan Woman farmer, do you have a forum for interaction? I would like to learn the American farm sustainability. Your article on this topic doesn't help me at all. You said that this was "Ways woman farmers are changing US agriculture".